There was once a time when Oklahoma City Thunder fans really cared about the Toronto Raptors’ record. Not only would we scour the box scores for our games, but we’d also look at the Raptors’ games. Reason being, of course, because we owned the Raptors’ pick in the 2013 draft as part of the James Harden trade. The restriction was that the pick had to be between selections 4-14. 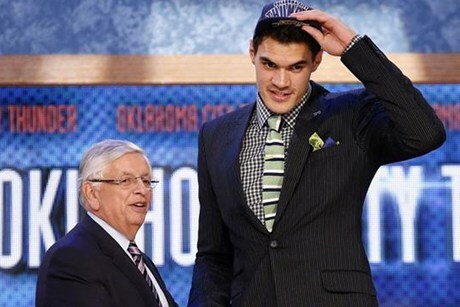 Luckily the Raptors missed the playoffs and with that pick, the Thunder selected Steven Adams. Fast forward to this season, and we could really care less about Toronto’s record. The Thunder have beat the Raptors 3 straight times spanning the last two seasons. The Raptors are team that you could term, “in flux”. The hired Masai Ujiri as general manager to take this middle of the road franchise, blow it up, and quickly rebuild it, like he did with the Denver Nuggets. His latest big move was to trade Rudy Gay and his $17.9 million dollar price tag (and possibly $19.3 million dollar next season if he opts in) to the Sacramento Kings for bit parts, most of whom are expiring after this season. That clearing of cap space will come in handy next season and beyond. But in the now, the Raptors are a bad team. 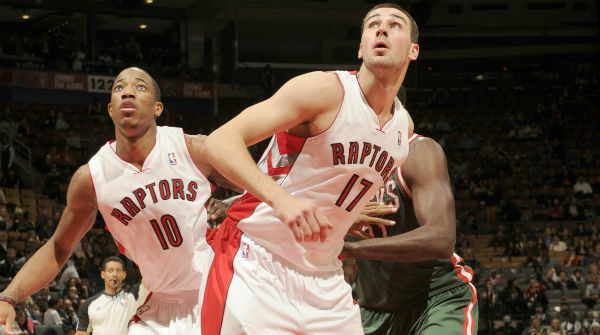 Their back court is led by PG Kyle Lowry and wings Terrence Ross and Demar Derozan. All three players are talented, but are inefficient and need a high volume of shots to get to their averages. The front court is one of more promising ones this side of Detroit in the Eastern Conference. Jonas Valanciunas and Amir Johnson are threats for a double double every time they step on the court. The bench play is a lot like the team itself, which is to say, not very good. 1. 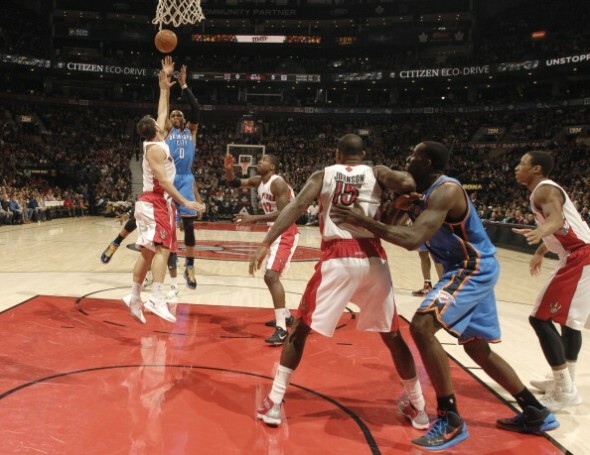 Rebounding – Toronto is a terribly inefficient team from the perimeter. Their wing players who average at least 10 minutes per game combine to shoot 39.9% from the field. Lots of misses means lots of rebounds. Valanciunas and Johnson are adept at grabbing rebounds, especially offensive rebounds (grabbing 5.3 offensive rebounds per game between them). 2. Bench play – Toronto’s bench is veteran laden, but really lacking when it comes to anything offensive. This may be a time to take over the game as the Thunder’s bench has been humming lately. 3. Complacency/Trap Game – This game has all the makings of a trap game. Playing at home, against an inferior opponent, having just played the rival Spurs, and not playing again until the prime time tilt against the Knicks on Christmas. All a bad team needs is hope. It’s Christmas season, but let’s not be in a giving mood tonight.